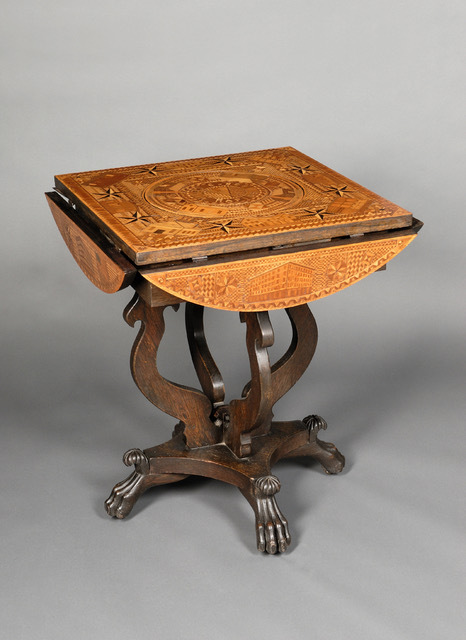 Description: Marquetry Oak Drop-leaf Side Table, Pete, J. Sargent (American, 1839-1912), Cedar Rapids. iowa.1 911, the round top inlaid with images of local landmarks and census data, stars, herringbone, sawtooth, and checkerboard pattern with four drop-leaves over a four-part ogee curved base with four carved paw feet on casters topped with carved shells. original surface. A self taught craftsman, Peter J Sargent took up the hobby of furniture making and marquetry after retiring from a career as a railroad engineer and mechanic. Having lived in Cedar Rapids, Iowa, at various points during his adult life, the New Hampshire native settled there for his final years, occupying his time with his craft. 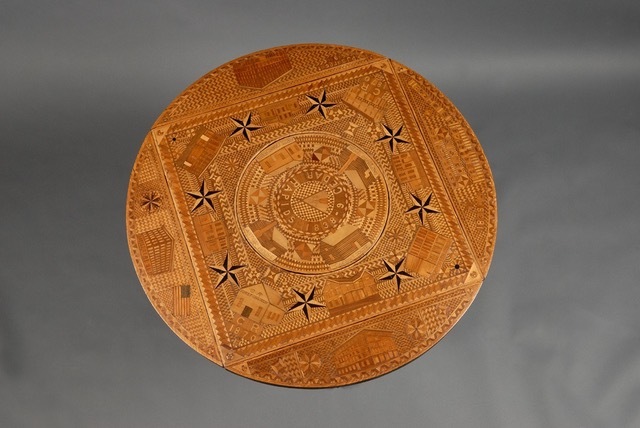 Known to have produced similar tables for friends, family, and the local Masonic Lodge. 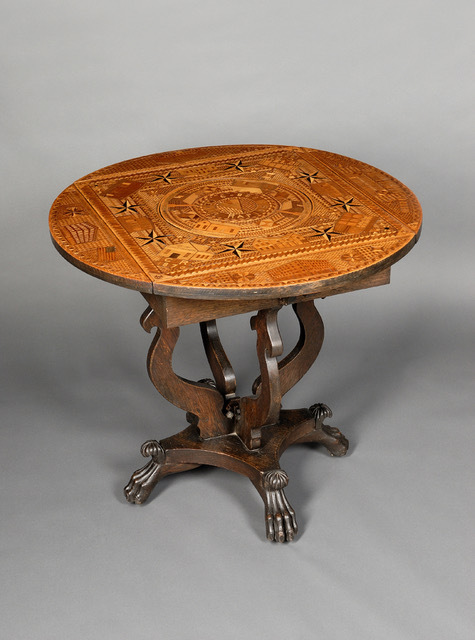 Sargent designed executed this table is a visual history of his adopted hometown. Within the central circular portion of the tabletop appears that earliest history of Cedar Rapids. Sergeant inlaid the name of the town along with the date of its founding(1839) and depicted the earliest log cabins built by the first known European settlers. He used the outer portion of the table's main surface to depict the next generation of growth for the young Midwestern city. Illustrating buildings constructed by the towns earliest industrialists, real estate developers, and even journalists. Sargent touched on the vibrant river-powered, agricultural based economy that developed across the upper Midwest in the second half of the 19th century. On the four drop-leaves he continued this theme, concluding with the population numbers for the city at the beginning, from the year sargent first live there's a young man, and the presumptive year of the table's construction. Illustrating his surroundings with careful attention and skill, the self taught craftsman epitomizerd the definition of folk art. His time, effort, and passion resulted in a piece of functional furniture that beautifuly illustrates the history of his little-known but beloved hometown.